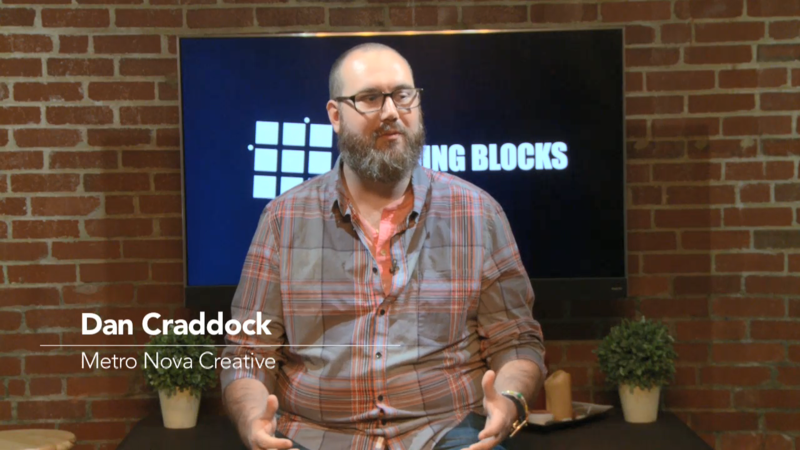 Dan Craddock of Metro Nova Creative shares his three pillars of branding on this week’s episode of Building Blocks, the show where we uncover the ingredients to a fulfilled life from the people we interact with every day. Don’t forget to check out the show’s producer’s, Jen Erickson, interview with Dan about his story and how he balances being a husband, father, and entrepreneur. You can watch it here. Hey, guys. My name’s Dan. Again, I’m from Metro Nova Creative. We do brand development for small businesses. Wanted to talk a little bit today about that process and some of the things that we do with our clients. I like to say a lot of times, again, our clients primarily are small businesses in that first 5-10 year range. Something that we do is we don’t just sell logos and marketing and websites and branding solutions. We sell time to small business owners because that’s your biggest asset. A lot of those things like social media or building a website or doing those things take up a tremendous amount of time, especially if you’re not familiar with that platform. If we can provide products that’s going to take that off your plate and let you hang with your family a little bit longer, spend some time with your kids, or take that vacation, or whatever it is, that’s what we want to do. As we’re approaching all of those projects, something that I always have in the back of my mind is my go-to pillars of branding. Now, branding in today’s current market is the idea of the emotional connection between a consumer and a product. That’s really what it’s been stripped down to. I’m a little bit old school, so I’m more inclined to think that branding develops from a visual identity aspect of things, so the logo design, the icon, really what it is in its tradition. The reason that is, is because, again, a lot of our clients are small businesses owners. They don’t have Kim Kardashian and Pepsi money, so how do we make that emotional connection for them, and that’s where these pillars are branding. We’ll come in and help them out. That’s a really important step in the pillars. It’s really engaging. It’s really exciting because especially for a business that’s already been established, maybe, and they’re looking to do a new logo, it can be really intimidating. It could be a lot of stress considering all of that change. This part of that process allows me to sit down and get them engaged and get them more comfortable and get them a little excited talking about why they’re doing this in the first place. Again, Love Your Brand is our slogan, and that’s a big part of what we do is try to remind our clients of why they love their brand in the first place, and while they’ll love the new one too. An example of the difference for Metro Nova Creative is our team has got years of experience working with small business owners and production facilities and stuff like that and dealing with the same thing over and over again of, “Hey, we need your vector file for your logo,” and they look at you like, “I got so many on Craigslist. I don’t know what vector file is. I have no idea. I have a jpeg. It’s stretched, and it’s weird, and it’s pixelated.” You ask them all the same, “Well, why don’t you get someone to do a professional logo for you?” A lot of small business owners, I think in their mind, they assume they don’t have the equity in the business to get in touch with a firm and to get that project done the right way. Our difference is providing that to them. I mean, the number one thing you can do when starting a business is find a problem and sell the solution. That’s what we did. We found a problem with small business owners that felt like they didn’t have the equity to have great branding, and we sold them a solution for that, and we gave them affordable packages that allows them to grow and be sustainable and be productive. That’s the difference. The next one a lot of people will call … Everyone has their own version of the pillars or branding, and these are mine. I pick and choose, and everyone does their own thing. A lot of people will say the promise is the second one. I just don’t totally agree because I feel like the promise, even as a business owner, you promise not to give people terrible products, like you promise not to tell them, “I’m selling you a car,” and you give them a piece of toast. Obvious. It’s very clear, so I like to say the purpose, your “why,” so to speak. What’s your purpose of this product? Who are you helping? What are you changing? Again, asking these questions, they get the client thinking, and they get engaged, and they really start thinking about who they’re selling to and how they’re going to do that. All that really helps us start getting things going, developing that brand, and coming up with a plan for them. I’m okay with that because my purpose is to make sure that whatever that they buy, they’re educated well in the product, they understand what they’re getting into, and they’re getting the right product because if they spend all their money, and their budget goes down to zero, that’s a bad business decision. They’re not around next month to buy more stuff. Our purpose is, like I said, to hold hand, be a good sponsor for them, and help them through that process and make sure that they’re well taken care of. The final pillar is really where we start narrowing down the last aspects of a logo design or the visual identity or how we’re going to present it on social media or whatever platform we’re going to end up using building a website, and it’s the target persona. This one is always the funniest with clients who have never really put the thought into who their target audience is for small businesses. If you don’t blow your whole budget on trying to market with “everyone with a house,” just find one neighborhood of people with houses and just say, “Hey, we’re going to do a great job for this entire neighborhood,” or this type of person or whatever it is. That’s really that third pillar is just trying to manage their expectations, find the economically-sound decision on how to market and how to get out there so you’re not throwing away dollars and printing $20,000 Every Door Direct Mail cards that go anywhere or get thrown away, or the wrong message was on it or whatever it was. We want to make sure that we’re spending their money wisely, and then grow from there. We really are taking what we learned, “Well, let’s adjust a little bit, and expand a little bit and expand a little bit,” and that’s really the sustainable growth that we want to help with our clients. That’s that that final pillar of branding. All of that together, it’s fun. Again, it’s meant to be engaging to get them excited. We can do some SWOT analysis, but a lot of times, we’ll come to a client’s office, so we don’t expect them to pull out their dry erase board and start doing all the SWOT analysis stuff, but it’s good to think about those things. Like I said, even if the client doesn’t realize it, I’m thinking about those. Those are questions I’m asking in the back of my head throughout the process of a logo design and creating a brand and finding identity for that small business owner. That about covers the pillars of branding. If you have any questions or comments or you want to know more information, please just comment on the video, and we’ll get back to you. Hope everyone enjoyed. Thank you so much. An experienced corporate video producer, Abe is your business video specialist. He specializes in video production, video SEO, video marketing, and ranking videos on search engine organic results pages. Abe also oversees the strategy and operation of Ugly Chair. He is a current MBA student at the University of Mary Washington. It doesn’t have to. Click on the link to fill out a short form to tell us where you need help with video marketing.